In 1993, Nintendo released a top loading NES model 2. This newer model was scaled down to nearly half the size of the original. The case was a sleeker design (Like a smoother Famicom). The cartridge port was more stable, and used eject & power buttons similar to it's successor the SuperNES. Even the controller had the "bone-like" shape of the SuperNES. This new model sold for $45. The cheaper price came at the loss of the original model's interface and A/V output ports. 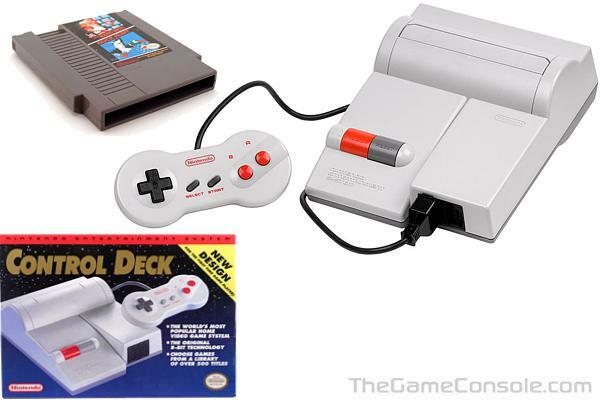 Nintendo dropped support for this new model a year later. Today, it's a collectors item. Nintendo's success introduced some of the most interesting accessories and conversions. Who could forget the "Power Glove", and "Rob the Robot". Nintendo slapped "NES-like" hardware into an Arcade cabinet and released Nintendo Playchoice to arcades everywhere. In Japan they released a disk drive accessory that allowed gamers to download games from vending machines onto a disk.